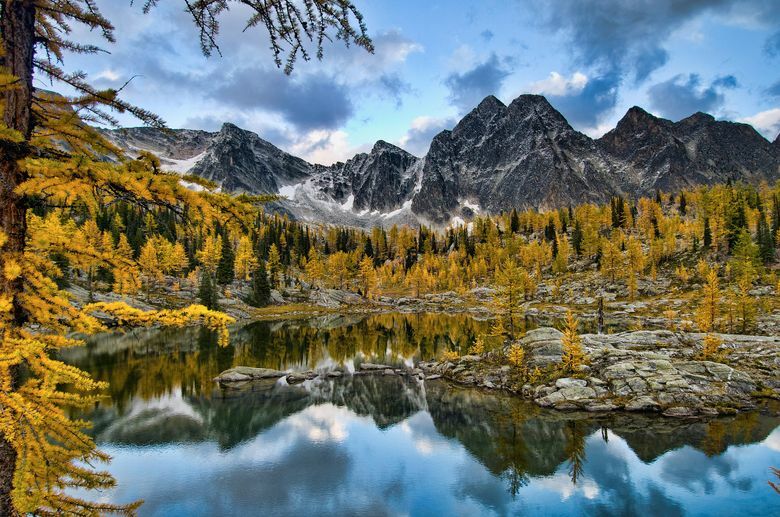 Golden larches, rugged scenery are draws to Washington’s northeast corner. The International Selkirk Loop, which straddles Washington, Idaho and British Columbia, is best known as one of America’s quintessential scenic drives. But while you can see a lot of great scenery from the road, you’ll miss out if you don’t leave the confines of your car. Billed as “North America’s only multinational scenic loop,” the 280-mile loop runs through far northeastern Washington, southeastern British Columbia, and northwestern Idaho. It encircles the southern half of its namesake, the Selkirk Mountains, which stretch from just north of Spokane into the far reaches of interior British Columbia. Here, the surroundings switch from the rolling high alpine hills around Spokane to thickly forested, steep slopes. Autumn is one of the best times to hit the road trip, which skirts the rivers and lakes at the Selkirks’ base. The weather is typically cool and dry, but snow has not yet hit. The fires that smudge the sky in late summer are mostly on the wane. Deciduous trees’ leaves are turning, sending streaks of color shooting through the evergreens. Most striking are the coniferous larches that blanket hillsides in swaths of bright yellow and orange. For maps, lodging and a guide to other amenities along the way, see selkirkloop.org. More about the Canada side of the loop: kootenayrockies.com/partner/intl-selkirk-loop-tour. Water and mountains shape the loop’s contours. From its southern tip about an hour north of Spokane, the loop meanders north along the Pend Oreille River. Near Metaline Falls, it crosses the border and weaves through forests to Nelson, B.C., perched on a steep hillside above Kootenay Lake. Road trippers take what is said to be the world’s longest free ferry ride, traversing the lake in 35 minutes, before heading south past the sprawling farms and orchards around Creston, B.C., and back into Idaho. The route follows the Kootenai River south through Bonners Ferry and Sandpoint, where it rejoins the Pend Oreille River. Along the way, the loop passes charming old mining towns and gorgeous lakes and rivers, with the mountains always at the center of everything. I first discovered the Selkirk Loop on a motorcycle touring expedition. While it’s a great route for that kind of biker, I noticed quite a few on nonmotorized bikes as well. Cycling is one of the best ways to see the Selkirk area. Road bikers can make their way along the loop’s generally uncrowded two-lane country highways, occasionally detouring onto back roads or paved or graded trails en route. The International Selkirk Loop website includes a 10-day, 400-mile cycling and camping itinerary for self-supporting cyclists. It includes such details as where you can have your bike shipped if you’re arriving by airplane or where to park your car if you drive to the area. Every suggested campground has showers, and other amenities are always nearby. An interactive map shows elevation profiles along the way — handy if, like me, you’re not keen to slog up steep slopes. The route incorporates detours “that get them off the main scenic byway and to a less-traveled side road where they have less car traffic but can take in the same scenery,” said Stephanie Sims, the loop’s executive director. Other cyclists take a cushier approach, hiring companies such as Redmond-based Bicycle Adventures to take them on supported tours, staying in hotels or guesthouses and eating in restaurants along the way (bicycle­adventures.com). The area is also a mountain-biking destination where adrenaline junkies take advantage of the roller-coaster terrain. Colville National Forest in Washington features 30 designated mountain-biking trails. 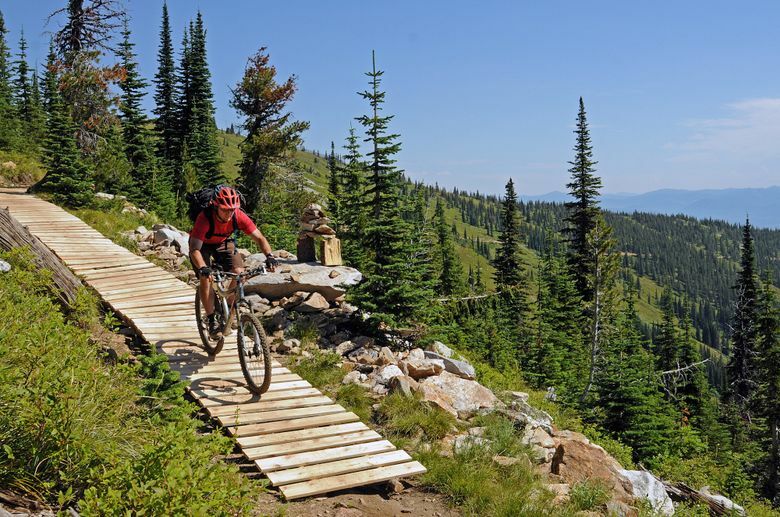 In northern Idaho, Schweitzer Mountain Resort offers lift-serviced mountain biking during its summer season. In B.C., the recreation-obsessed towns of Nelson and Rossland are hotbeds of technical mountain biking but also offer easier lowland routes. The same terrain that appeals to mountain bikers draws hikers in droves. “There are millions of acres of public land in the Selkirk Loop footprint,” Sims said, and trails crisscross it all. 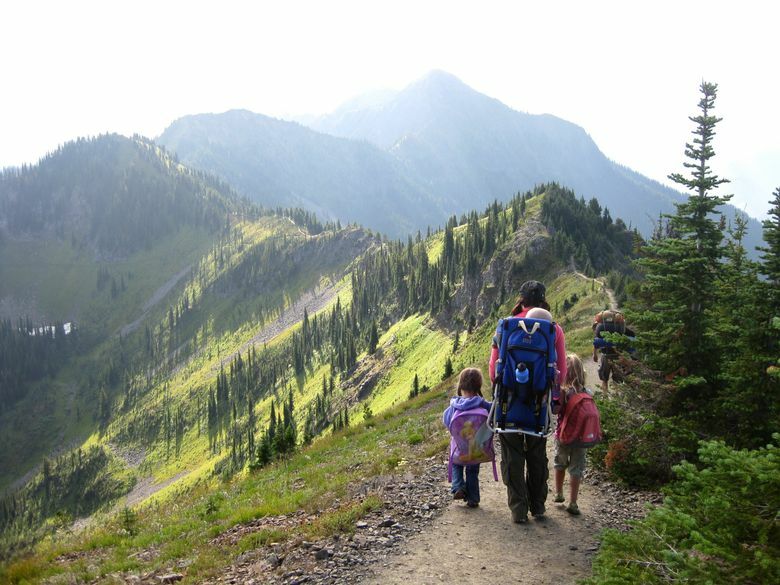 They range from quarter-mile kid-friendly walks to multiday backpacking expeditions. Grab a “Day Hikes of the Selkirk Loop” map in one of many visitor centers along the route to plan your journey. Many of the recommended hikes lead to waterfalls. “You can hike right to waterfalls and often climb right into the waterfall,” Sims said. Near her base in Bonners Ferry, Idaho, for example, the short Snow Creek and Myrtle Falls trails lead to pretty falls. Since the area is part of a major flyway, migratory birds are often part of the hiking experience. You might also spot elk, moose or even bear, especially in one of the wildlife refuges along the way. Autumn brings a chance to hike among larches, whose color peaks in late September and into October, sharing the trail with smaller crowds than you’ll find in some Western Washington areas. Sullivan Lake, near Metaline Falls, offers one of the state’s best larch displays. While recreation is a big draw along the loop, it’s not exactly a jaunt through total wilderness. Dining options range from dive bars to locavore bistros. North of Nelson, a string of hot springs lies just off the road. In the little mountain villages that line the route, artisans make everything from blown glass to Harry Potter-style brooms, and they often welcome visits to their studios. Seattle-based freelancer Christy Karras is co-author of “Motorcycle Touring in the Pacific Northwest” (Morris Book Publishing).